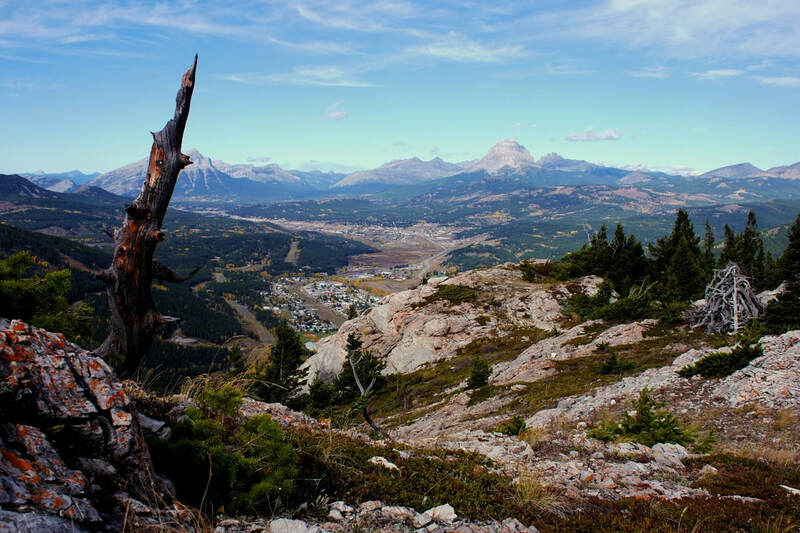 Turtle Mountain is located in the Crowsnest Pass in South Western Alberta. If you want to make it sound super intense, it's also the location of Canada's most deadly rock slide! You can't miss it as you suddenly start driving though gigantic piles of boulders on each side of the highway. It was once the location of a small town named Frank, which was buried over a hundred years ago by a massive rock slide. The mountain is called Turtle Mountain because the early natives in the area believed that the mountain was slowly moving, which was pretty bang on! It's now a popular tourist site in the Crowsnest Pass. ​It wasn't until a few years ago that I realized that you can actually climb it! ​My wife and I, along with our two friends Brian and Erin, decided to attempt it. None of us had ever done it before, but we researched a bunch and realized that it wasn't quite as scary as it seems. 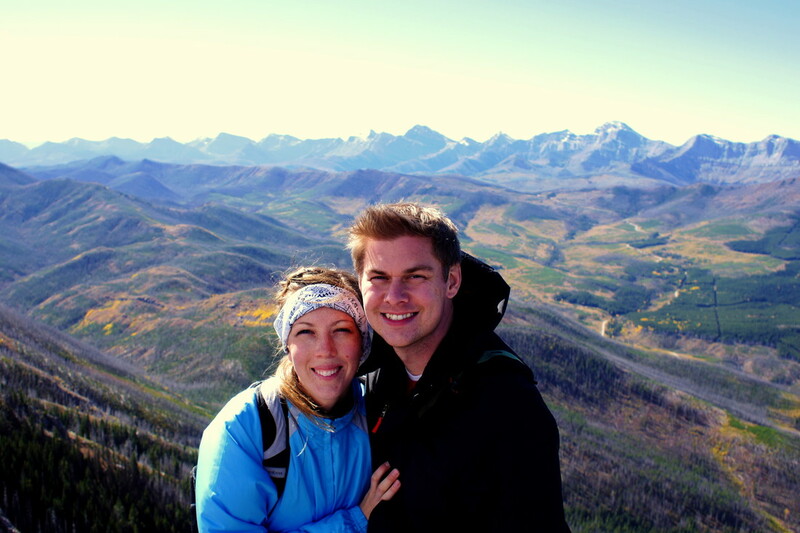 We woke up early, leaving our kids at home with the grandparents, and got to the base of the mountain located near the back of the Town of Blairmore. It's strange because one minute you're driving through a residential neighborhood, and the next, you stop at the end of a gravel road and start heading up the mountain. The route we chose is on the west side of the mountain (and no, you do not hike up the loose rock where the slide was). It's quite a steep climb for most of it. You start through the bushes and trees, and it's quite easy to lose the trail, so luckily there were orange ribbons tied onto branches as you went to know the best route. It's pretty interesting the whole time because a lot of times you're hiking up big bare rocks with multiple ways to climb. You quickly start to rise over the Town of Blairmore and get some pretty good views of Crowsnest Mountain in the distance. It's the distinct dome-shaped mountain towards B.C. One thing you'll need to be prepared for is the wind! 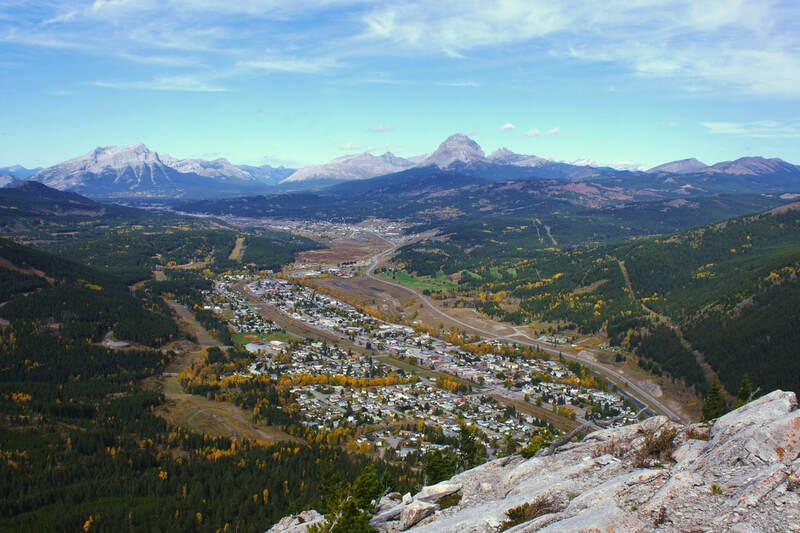 The Crowsnest Pass is known for being like a wind tunnel all year round. You'll notice that many of the trees lean or are quite gnarly because of the high winds. I'd recommend having a hood, as well as a head band or bandanna to cover your ears. This will help them from getting too irritated from the constant pressure. We went in October, and it was still quite mild luckily, but definitely dress in layers because of the changing climate as you go up. 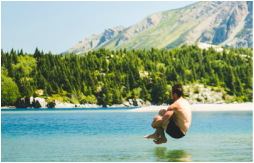 One minute you might be wanting to shed your shirt because of the hot sun beating down on you, and the next minute you may be fighting the wind to get your coat back on, while holding on to a tree branch so you're not blown off the mountain! Once you get above the tree line, it basically turns into a bunch of switchbacks of scree. You can see where the top of the mountain is, but sometimes you're not quite sure how you're going to get there. During this part, it is sometimes quite difficult to catch your breath, partly because of how steep it is, and partly because of the wind! Also during this part, you quickly rise higher and higher and is quite satisfying as you do. The best/most scary part of the hike is the moment you get to the top and get your first glimpse of the rock slide on the other side. 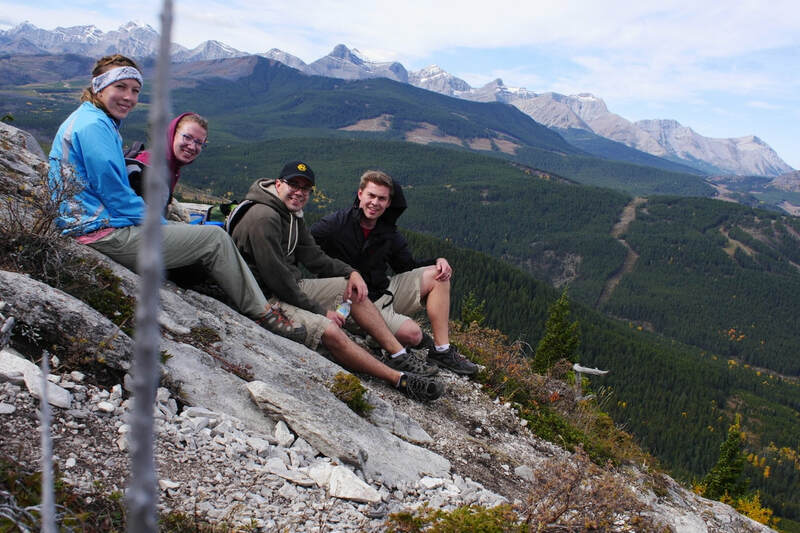 This is the part where you might want to forget that you're standing on Canada's deadliest rock slide! The cracks in the rocks and tons and tons of boulders below though, makes it pretty hard to forget! It's quite the feeling to see the view from the top and watch the tiny cars on the highway below! First thing you should do is find the water bottle at the top and sign the note book inside. We chose to sit down for a while and eat lunch while we took in the view. It was nice to sit down and have a break, but relaxing isn't quite the right word to use. We had to make sure our stuff was either attached to us, or else weighed down by a heavy rock or something so it didn't blow away. We took a bunch of pictures and after we had our fill, started to head back down. ​If you have more time and are feeling extra adventurous, you can actually make your way across the cracked rocks in what I'll call the "saddle" of the mountain (basically where all the rocks broke away and slid down) and go over to the other peak. Apparently there is a big helicopter landing pad as well as seismic monitoring equipment scattered all over the place. Call it being lazy, or maybe because we didn't have enough time, but probably more likely because we're parents and were wanting to get home safely to see our kids, we decided against doing that. The way down can be a bit scary at times because of the scree and rocks. It's harder to find the trail, so make sure you're paying close attention. We ended up getting close to the bottom, but spent another half hour looking for the right trail as we kept coming to dead ends and cliffs! This hike is not for everyone. If you're inexperienced or afraid of heights, I wouldn't recommend it. If you're looking for a unique peak to climb in a relatively short amount of time, this is a perfect hike for that. Make sure to check the conditions before to avoid rain or snow as well. It's pretty cool as you're driving back home to look way up to the top, over the rock slide, and see the spot where you ate your lunch! 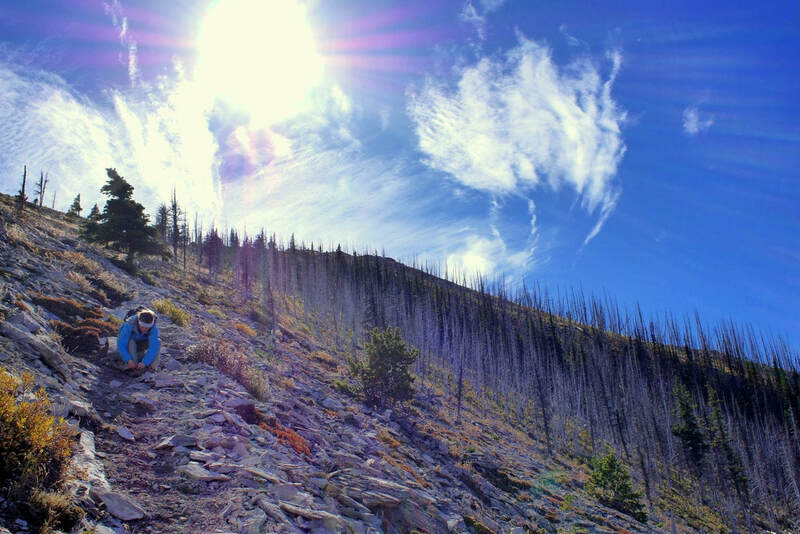 ​Definitely a Southern Alberta Bucket List hike to do!